McDougall & Potter were New York City iron founders in business from approximately 1864 to 1939. 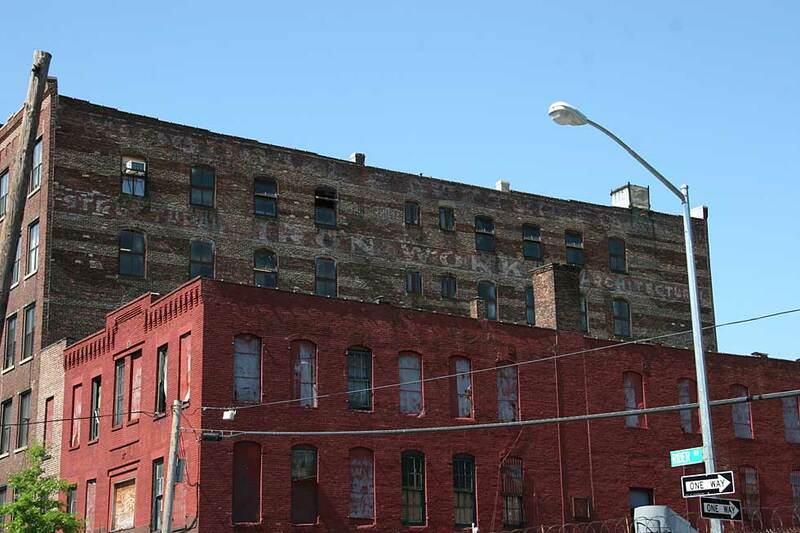 They had a foundry at 606-614 W. 55th St., in Manhattan, as well as this location in the Bronx on Rider Ave. The founders were Henry McDougall (1836-1910) and Roger Potter (1829-1917). When Henry McDougall died in 1910 the following obituary notice appeared in the New York Times, 13 Aug. 1910, "Henry McDougall of McDougall & Potter Company, iron works, Manhattan, died suddenly at his home at Bogota, N. J., yesterday, following a stroke of apoplexy. He was 73 years old, and leaves three adult daughters. Mr. McDougall had lived in Bogota nineteen years, and was one of the first Councilmen of the borough. His firm built the iron supports for the Brooklyn Bridge." Seven years later Roger Potter received only the following brief notice, New York Times, 15 May 1917, "Died: Potter. - On Sunday, May 13, 1917, Roger Potter, in his 89th year. Funeral services at his late residence, 366 West 55th St., tonight, Tuesday, May 15, at 8:30 o'clock. Interment at convenience of family." Roger Potter was recorded in the 1900 U. S. Census as 70 years old, born Jan. 1830. That he was in his 89th year in 1917, however, implies that he was born in 1829. The earlier year is also suggested by Potter's 1880 naturalization petition where he gave his age as 51. Roger Potter's grave stone (click for image) in Green-Wood Cemetery, Brooklyn, NY, is inscribed, "Roger Potter / Born Jan 13, 1829 / Died May 13, 1917." Both he and Henry McDougall were born in Scotland. The business was begun approximately 1864 at 505 W. 25th St. near 10th Ave. In 1870 they moved uptown to 775 10th Ave. near 52nd St., where they stayed until the early 1880s, when they moved to more permanent quarters at the river's edge, 606-614 W. 55th St. The first entry in a directory listing for the River Ave. Bronx address was in 1897. After 1921 only the Bronx address appeared, which remained their address until 1939. In 1898 the Annual Report of the Factory Inspector of the State of New York recorded McDougal & Potter Co. as employing 35 males who worked 53 hours per week. In 1896 the journal, American Machinist, reported, "The McDougall & Potter Co., of New York, has been formed to manufacture machinery and iron work. It has a capital of $50,000, and the incorporators are Reginald Steele and James M. Potter." These incorporators represent the second generation of officers at McDougall & Potter Co. James M. Potter (1870-1916) was Roger Potter's son, age 10 in the 1880 U. S. Census. His middle name was McDougall. Reginald Steel (1865-1947) (directory listings dropped the final 'e' from Steele after about 1900) was an immigrant from England. His obituary, New York Times, 11 May 1947, read, "Reginald Steel, president of R. Steel & Sons, Inc., manufacturers of forged and welded machine products in Long Island City, died Friday night in his home at 35-16 150th Street, Flushing, Queens, after an illness of four months. His age was 85. Born in England, Mr. Steel came to this country in 1884 and entered the employ of the McDougall & Potter Company, iron works. He served as president of the firm from 1908 to 1922, when he organized his own concern. He was a Mason, a member of the Salvation Army Association and the Flushing Hospital Association. Surviving are two daughters, Miss Mary Steel and Mrs. Edith S. Hatch, and two sons, Reginald A. and Thomas Steel." Another of Roger Potter's sons active in the business was Henry McDougall Potter (1889-1964), born to Roger's third wife. He appears in the 1910 U. S. Census, age 20, "Clerk, Iron Works," and he registered for the World War I draft 5 June 1917, age 27, born 13 Oct. 1889, New York City. He gave his occupation as "Assistant Treasurer, McDougall & Potter, 606 W. 55 St., New York." Polk's New York City Directory 1933-34 listed him as vice-president-treasurer at McDougall & Potter Co.
Other important figures at McDougall & Potter were Joseph J. Morgan (1831-1902) and John Morgan Piper (1873-1947). Joseph J. Morgan is listed as superintendent at McDougall & Potter in the late 1880s and was secretary of the corporation in Trow's Copartnership Directory in 1901. John M. Piper seems to have joined the company around 1910, became a vice-president, then became president when Reginald Steel left in 1922. For many years, John M. Piper, like Henry McDougall, was a resident of Bogota, New Jersey. A simple death notice for Piper appeared in the New York Times, 21 Feb. 1947, "death: Piper - At his residence, 375 Riverside Drive, John Morgan, beloved husband of Frances Youngworth-Piper, and father of Harold G. Piper. Funeral services at August Eickelberg Parlors, 934 8th Ave., at 55th St., on Saturday afternoon, Feb. 22 at 2 o'clock." An example of McDougall & Potter architectural iron is found at mcdougallpotter-founder.htm. Among other iron products McDougall & Potter manufactured coal chute covers. An example is found at mcdougallpotter-cover.htm.